The new iPad generates an extra 10 degrees when compared to the iPad 2, according to tests performed by Dutch site Tweakers. 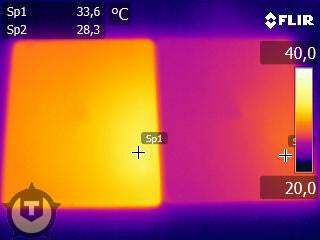 Put alongside an iPad 2 under an infrared camera, the tests show a significant running temperature difference between the new iPad and its predecessor, probably owed to a bigger battery and faster processor and graphics chip. The tests were performed using GLBenchmark for five minutes, after which the hottest point for the new iPad and iPad 2 was measured with an infrared camera. The lower right corner of the new iPad seems to be the hottest point, with a temperature of 92.5 degrees. The same place on the iPad 2 was around 10 degrees cooler at 82.9 degrees. Apple Tuesday denied any overheating concerns for the new iPad. A teardown of the new iPad revealed that Apple increased the battery capacity by 70 percent, but the battery itself is also 70 percent larger. Apple used the same dual-core processor in the new iPad, but upgraded the graphics chip to quad-core. So according to the teardown, on the lower right corner (from the back) there is only the jumbo battery, and not any chips (they’re on the left, running top to bottom), indicating the 42.5-watt-hour battery itself runs hotter. If this is not a manufacturing defect affecting only certain new iPads, it seems the high-resolution Retina display, which keeps the new iPad as the leading tablet, has taken an even bigger toll than previously thought. Follow @ Daniel Ionescu and Today @ PCWorld on Twitter.